This year I am trying to incorporate more seasonal activities in therapy, because the kids really seem to like it. Fortunately my school has not yet banned Halloween, so it's fair game :). 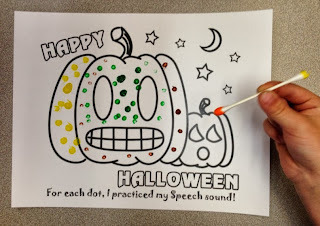 This week my students got to make a cute articulation project with Jack O'Lantern pictures. I adapted this activity from a similar one that I saw on Pinterest a while back, and the best part is that it is super easy to make (and - more importantly - cheap!). 1. Find a Jack O'Lantern coloring page online and save the picture to your computer. 2. Open the picture in Microsoft Word. 3. 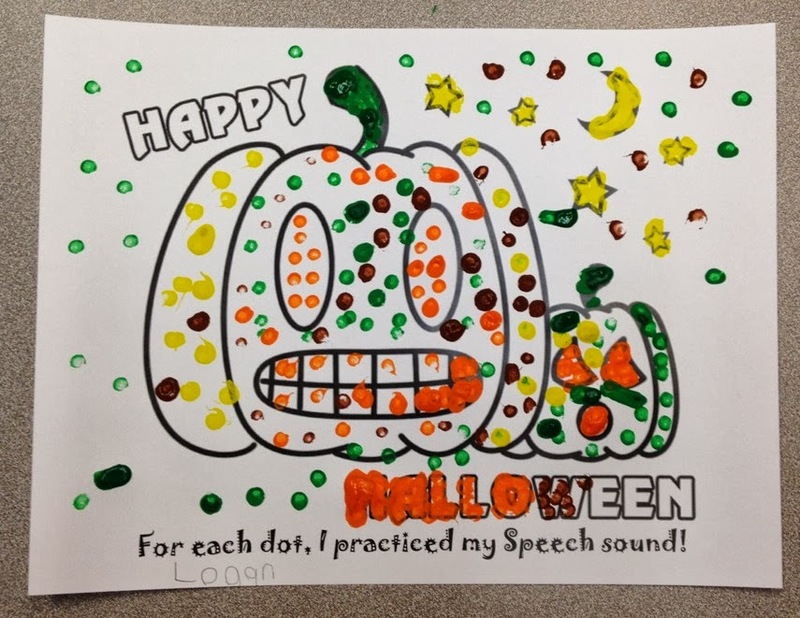 On the bottom of the page, insert a textbox with the words: "For each dot, I practiced my Speech sound." 4. Print this page onto cardstock or other thick paper. 5. Give a copy to each student. 6. Put paint onto a palette. 7. 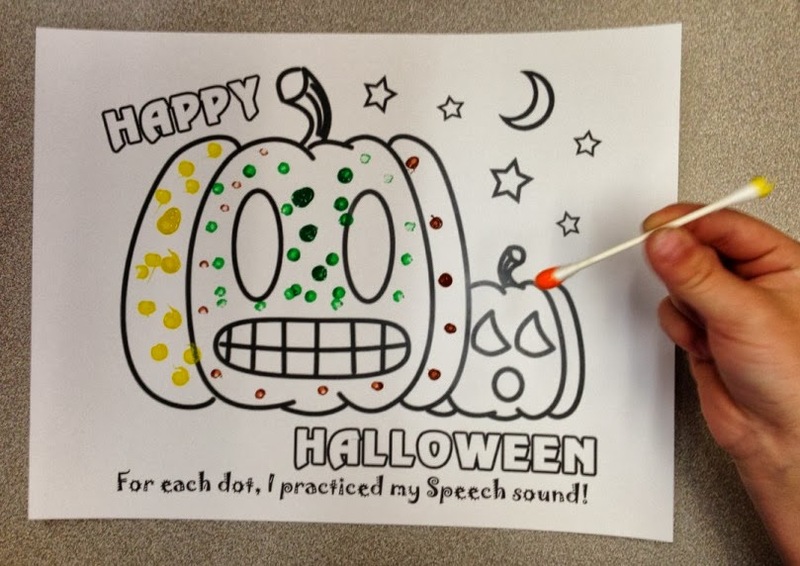 Have students dip Q-tips into the paint and make dots onto the page. 8. Every time they make a dot, they say a target word. One of my Kindergarteners made a rainbow pumpkin! I got tons of productions out of my students with this activity! This worked especially well with students who were able to practice independently while I worked with another student. I had some overachievers who insisted on covering every white space on their paper, and they worked extra hard. 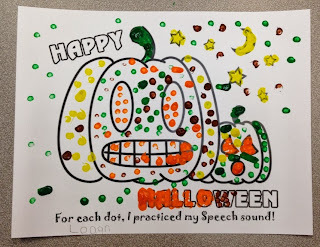 Some other students needed prompts to not just rapidly dot, but to make sure to really just place one dot per sound production. But for the most part, this activity was a success! I don't often do artsy projects, so a lot of my kids considered this to be a special treat and were really motivated. And they got to take it home after the pumpkins dried. I am planning to do this again around Christmas time, perhaps with a Christmas tree and ornaments? Fun times!